Mill 2.00: Moulin Boyes & Murphy, Baker Brook, NB. 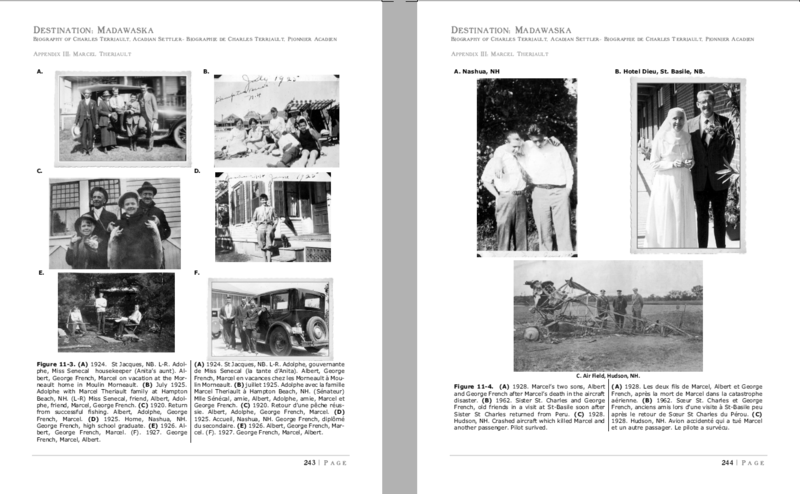 Speaking of Charles Terriault… it turns out that in the First Edition, we incorrectly identified an important photo. Using computers and my graphic software to look at the pixel level, I was able to see some evidence that the person in the photo was Charles Theriault! (See photo on the left.) It’s the only photo we have of Charles. By the way, he was born in 1796 and died in 1880. The photo was taken around the late 1870’s! My memory of Soeur Marie-Ange Thériault here at work in 1948 with the Religeuses Hospitalières de St. Joseph. I knew very little about ‘Ma Tante’ Marie-Ange in my childhood mostly because beginning in 1943, she devoted her life and work to the health care of the people of northern New Brunswick and northern Maine. At the age of 17, she volunteered to work with her aunt, Soeur Jeanne D’Arc Thériault, who was part of the administration of the Religeuses Hospitalière de St. Joseph (R.H.S.J.) at St. Basile, New Brunswick. I was three years old at that time, and Ma Tante basically lived with the Sisters at the Hotel Dieu hospital in St. Basile. The Sisters at that time were cloistered, so no one saw much of them except for the patients at the hospital. Later, Ma Tante received her calling for a vocation in the service of the sick as a member of the Religeuses Hospitalières. In 1954, I started my high school with the Oblate Fathers at their Juniorate Seminary in Bucksport, Maine. Being away from my family for the first time, I was delighted to receive a letter from Ma Tante soon after I began my studies. We continued to correspond on a regular basis from then on. Her mission was to cheer me on and encourage me to be a good student. 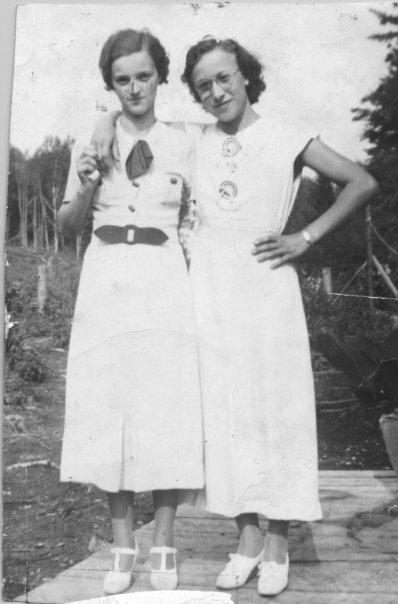 Her letters continued to come as I joined the U.S. Air Force and for some time after that. Ma Tante Marie-Ange was a selfless and humble person who loved her Jesus and committed her life to serving people around her especially the sick. I will sorely miss her in my life. I regret not being able to attend her funeral Mass. Fortunately, Rosemary and I visited with Ma Tante in Bathurst last Fall along with Tante Jeannine and cousin Nicole. We had a wonderful visit and a delightful lunch with she and her friend Soeur Gilberte McGrath and the other Sisters at the Mother House. Earlier in the Spring, our daughter Nicola and I were also able to visit with her when she was still at St. Basile. Just a few days ago, I received an e-mail from Soeur Berthile Beaulieu, the Archiviste for the Religeuses Hospitalières de St Joseph. Very thoughtfully and generously, she wanted us to have the biography of Ma Tante which Soeur Berthile wrote recently. Click on the link below to download and save the document on your system and open it by double clicking on the file on your system. 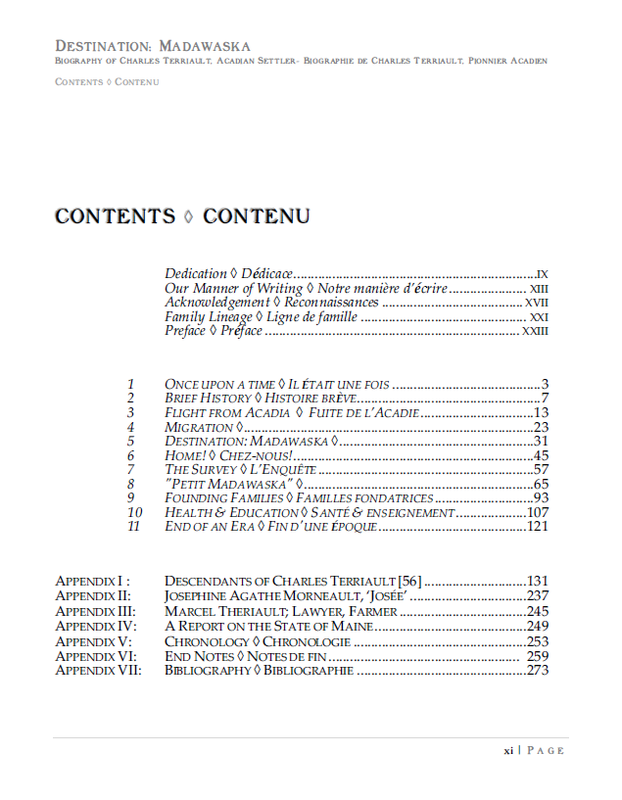 The biography is first presented in French. The English version follows. Circa 1923. Moulin Joseph Thériault in Baker-Brook, NB where the Theriault family home was also located on the right, beyond the view of the photo. The smoke stack on the mill indicates that the mill is powered by a steam engine drawing its water from a small brook that flowed through the property at that time. Joseph built the mill in 1905-1907 and operated it until he became ill in 1913. Joseph died in 1915. His son, Joachim inherited the mill in 1913 and operated it until 1945. In the years prior to 1945, Thaddée and later Dénis operated the mill before Joachim sold it that year. 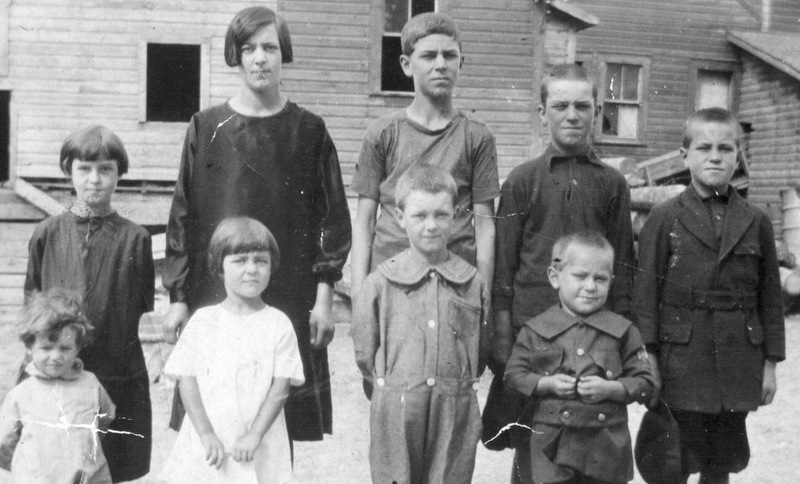 In this picture around 1923, we see Joachim holding his youngest son, George with his other sons and daughters at the mill, talking with his clients. 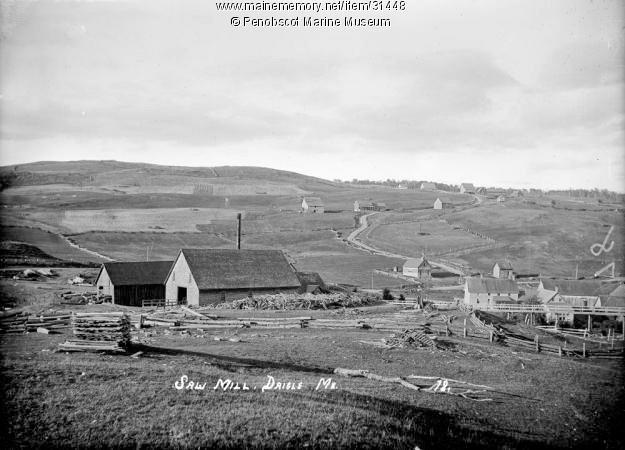 The house and barns on top of the hill is the Damase Daigle farm. Their other neighbors at the time included Firmin Levesque, Félix Daigle, Oscar Daigle, Vital Marquis, all on the northern side of the road from east to west. Joachim sold the mill to Raoul Couturier in 1945. (Courtesy Saint Coeur de Marie Parish Album ). The importance of mills and milling to the Theriault family has been well-known in the St-John Valley. As a young boy, I was fortunate to have been able to spend some time in my grandfather Joachim’s mill (N47.302037° W68.485479°) in Baker Brook, New Brunswick in the years before he sold it in 1945. It is interesting to note that historians and history refers to the Theriault Mill as the Joachim Theriault mill. The fact of the matter is that Joachim inherited his mill from his father, Joseph who built the mill in 1907 to serve the local farmers and families. No doubt it was Joachim’s work of improving the mill and his role in the community as the miller of Baker Brook and St Hilaire, that the mill carries his name in history. 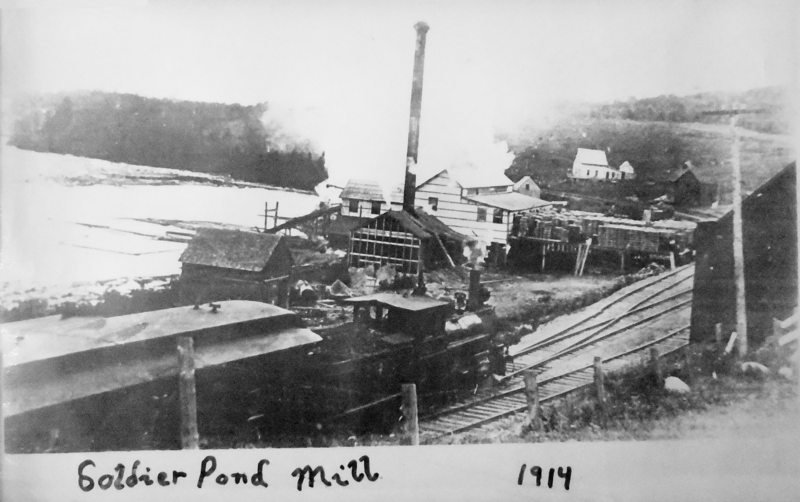 In my work on my last book “Destination: Madawaska”, I learned that mills and milling were important to my great-grandfather, Joseph as well. All references to the mill refer to the mill as the ‘Joachim Theriault Mill’. In fact, mills and milling in my family lineage started with Joseph. It was he who built the mill. His father, Dolphis was a farmer who owned large grants of farm and time land in St Jacques. 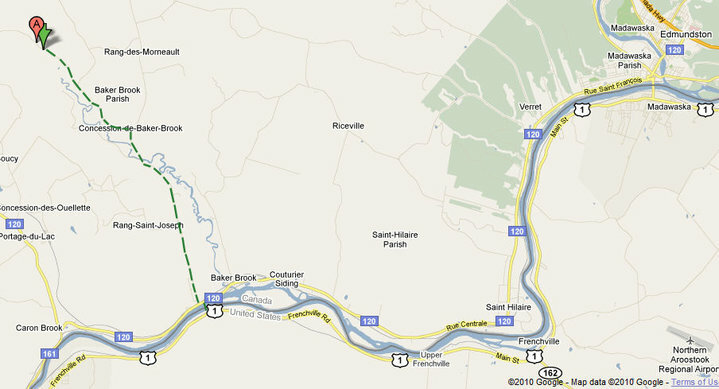 His grandfather Charles, the first Acadian settler in present-day St Jacques, was also a farmer and owned a grant of land in the village of present-day St Jacques that included all of the land from the Rivière à la Truite north to the Cemetery going 1.5 miles southwest from the river (170 acres). 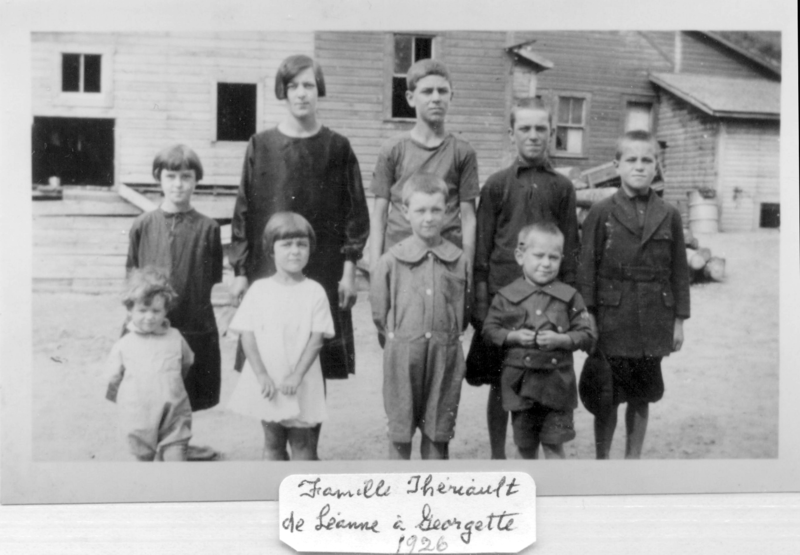 In early June 1926, 9 of the 14 eventual children of Joachim and Annie Thériault from Léanne to Georgette. In their front yard in front of the family mill. The flour mill was in the right part of the mill while the saw mill was on the left. Thérèse was born a day or so earlier and was being baptized on this day of the photo session. (Left to right, back row: Annette(8), Léanne(16), Dénis(14), Thaddée(12), Théodule(11). Front: Georgette(1), Rita(5), Félix(7) and George(4). (Rémi and Georgette Cyr Family Album.) CLICK TO ENLARGE PHOTO. So, it has been my objective for some time to write my great-grandfather Joseph’s story; a story that will shed some light on how he came to be involved in the mill business. I actually started working the project of researching mills as part of the World Acadian Congress CMA 2014 when I was invited to speak at the Theriault Family Reunion Conference on the migration of the Theriault family to the Madawaska territory from the south in Acadia and from the north in New France (Québec). 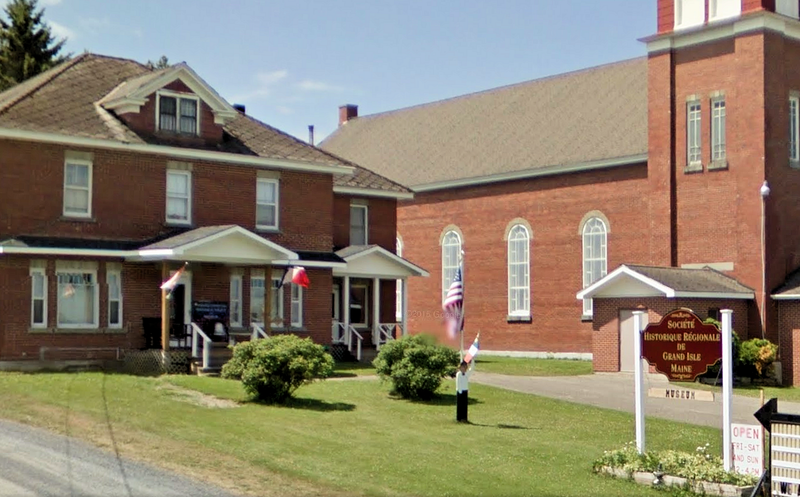 I was thrilled to hear that the Conference would be held in Baker Brook at the Holy Heart of Mary Church, the church that was built with the lumber that was milled by Joachim Thériault himself. 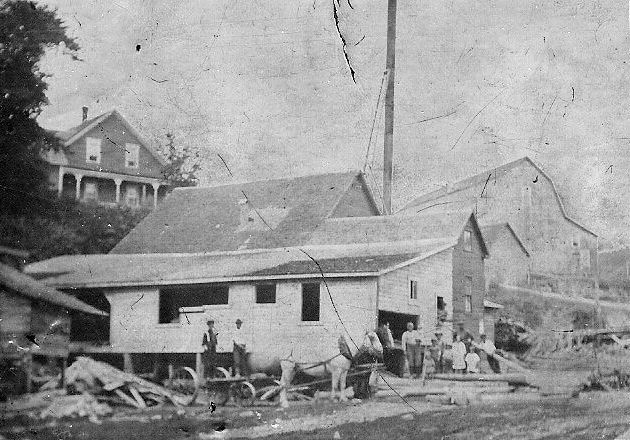 Joachim had milled most of the construction lumber at his mill but the large foundation pieces were milled on site using a transportable mill that later made history in the Valley newspapers. During the CMA activities, I discussed the scope of my book “Moulins du Madawaska” with Jacques Albert, editor of the Société historique du Madawaska. My thinking basically was to document the biography of Joseph Theriault and his son, Joachim, beginning with Joseph’s childhood living in Moulin Morneault with his foster parents, David Rousseau and Caroline Plourde and another foster child, Philias Morneault. After some discussion, Jacques suggested that we include a survey of the mills of the St John Valley. He noted that while a few individual communities have written about the mills of their specific community, no one has taken the time to research and publish a survey of all of the mills in the Valley and their role in the development of the Valley. Back in 2013, I spent a week in Grand Isle enjoying the hospitality of Gordon Soucy, Curator of the Grand Isle Historical Society museum looking into the mills on the American side of the St John Valley. He had pulled much of the materials on the mills of the St John Valley from his museum library. I spent the week reviewing the stacks of materials, taking notes and scanning the materials and photos that I thought I might use. I appreciate very much the Historical Society’s generosity and support for this project. After the CMA2014, I took a break from my work on family history and diverted my attention to local historic preservation work in my home town. My work on Joseph’s biography was put on the ‘back-burner’ for three years until last Fall when I made my plans to spend a week in the St John Valley this spring and pick up where I left off. After reviewing and organizing the results of my week with the Grand Isle Historical Society, I had about 100 possible mills that needed some investigation. So, my key objective for my week this Spring was to confirm the data that I had on my list of 100 mills. In addition, I also needed to make sure that my list was complete. So, I contacted Lise Pelletier, Director of the University of Maine’s Acadian Archive to let her know of my project. I put a plan together to start with the American side; two days for the Frenchville to St Francis, and the Madawaska to Van Buren stretches and the remaining three days on the Canadian side: St Basile to Grand Falls, St Jacques-Moulin Morneault, and the last day, Saturday, doing Clair to Connors. I also scheduled my visit at the Acadian Archives on our first day since we would be passing through the area. So, that was my plan. Our trek to the Back Settlements of Upper Frenchville, Maine. After slogging up the 800′ incline to the crest (white dot) on an old, abandoned, washed out trail, we continued on up the ‘Cote Vitrée/Glass Hill’ to Daigle, or New Canada where our first mill site was located. (Google Photo.) CLICK TO ENLARGE. In addition, I had asked my daughter, Nicola to join me for the week. 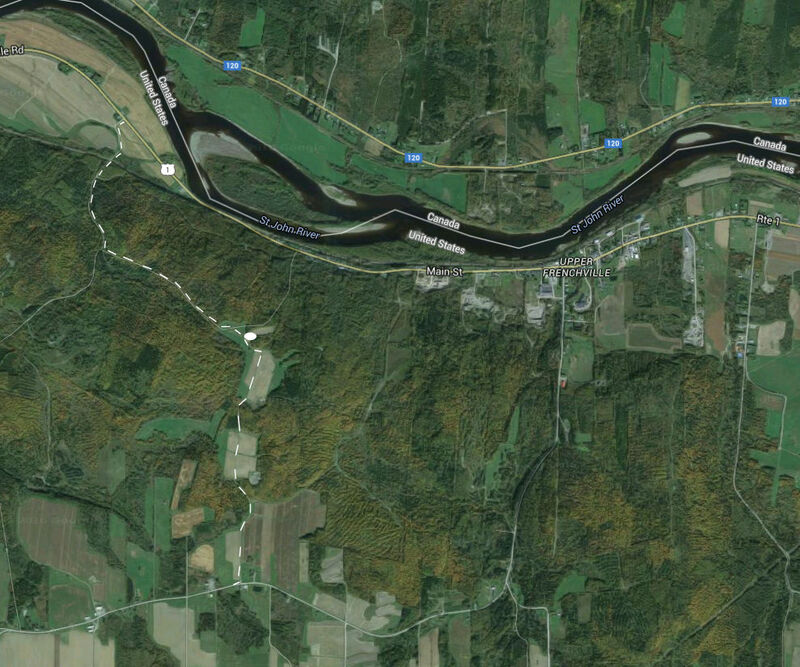 I thought this would be a good time for her to see where we lived in Upper Frenchville, possibly climb to the top of the mountain and in general, meet some members of her extended Theriault and Dubé/Trudelle families and some other good people in the Valley. View of the St John Valley from the top of my father’s mountain in “Sainte Luce”, or Upper Frenchville as they call it today. 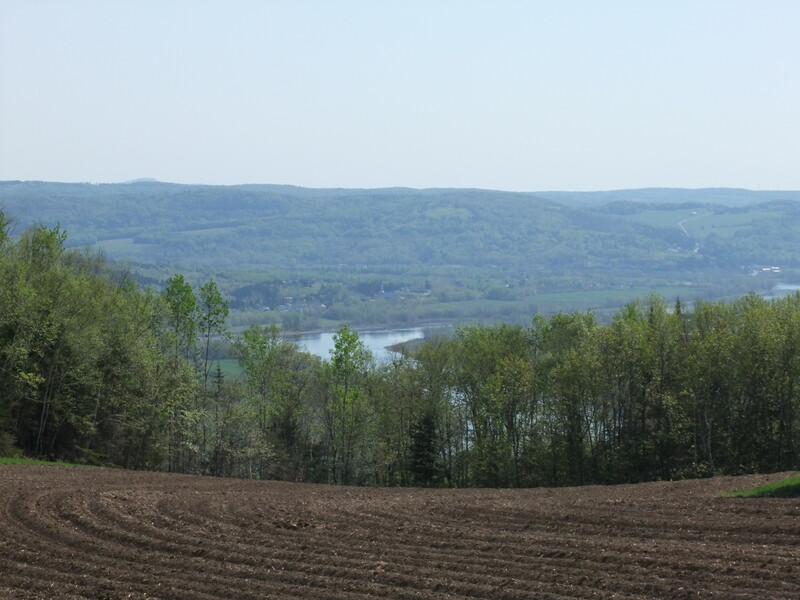 The rich soil of the valley is evident in this field which has been recently prepared for potato planting. (J.R. Theriault photo.) CLICK TO ENLARGE. So, the first day, we drove up the mountain with my trusty Toyota truck taking the short cut to the Back Settlements from US 1 just east of the former Eli Morin house going to the ‘Deuxième Rang’ Back Settlement. There we would see some of my father’s land and the top of the mountain where we would see that wonderful view of the St John Valley that I enjoyed while hiking around in my childhood. The road quickly deteriorated to a very narrow trail but we pushed through and emerged on top about 800 feet above the St John River. It was as beautiful remembered it. DENIS DAIGLE MILL. Cemetery Hill Road, New Canada, ME; 47°11’20.85″N 68°27’46.38″W (Courtesy Penobscot Marine Museum.) CLICK TO ENLARGE. From there, we continued through the 2nd row of the Back Settlements towards Daigle, our first mill site. Arriving in the village, we saw an old gent mowing the Cemetery. I stopped and he turned off his lawn mower. I introduced myself and explained my project. His name was Lincoln Nadeau, a native of Daigle. He knew the Coulombe’s who I knew well. Long story short, he knew exactly where the Denis Daigle Mill was and he added that I should talk to Paul Lozier in Soldier Pond. Lincoln said that there are several other old mill sites in the area and that Paul would know about them. Heading out to Soldier Pond, we found Paul Lozier at his garage and also was very enthusiastic to talk about the old mills. He immediately pointed to one mill on Soldier Pond within sight and gave some of the details about the Soldier Pond Mill. He very generously offered to let me photograph an old photograph of the old mill that hangs in his General Store in Soldier Pond, shown on the right. SOLDIER POND MILL. ca 1900 – late 1950’s. N 47 09.224 W068 34.57. (Courtesy Paul Lozier, Soldier Pond General Store.) CLICK TO ENLARGE. Before letting us go, he recommended that I talk to Mr. Allen Stadig by the Christmas tree farm not far from his garage in Soldier Pond. He would tell us about other mills. (The name was of high interest to me given my finding of the Stadig shingle mill in Connors.) He also told me about another mill I didn’t have on my list: the LeBoeuf Mill. Other people to contact included Chad Pelletier (Fort kent Historical Society), Louis Pelletier, Jr. of Allagash, and Carol Pelletier who he said was in charge of the St. Francis Historical Society, and someone who knows alot about mills in the area. While I was excited about the new information, I realized more and more that my list of mills was growing and that I might have to adjust my plan. At the peak of his mill business, my paternal grandfather, Joachim, acquired some land in the back settlements or, ‘les concessions’, of Baker Brook alongside the Reed Brook. He and his sons cultivated the lumber on the land which he milled into construction lumber and sold to the local farmers and people of the village. Joachim inherited his father’s mill a few years before his father, Joseph died in 1915. Joseph constructed the mill in 1907 to serve the village and the surrounding area. From the very beginning of its history in the early 1800’s, Baker Brook was known for its mill because the first settlers of the area, the Baker brothers, Nathan and John who came up from Penobscot County in Maine to settle in present-day Baker Brook, built the first mill and settled on the Baker Brook just south of NB Highway 120 (Note: Enter this coordinate 47°18’2.21″N 68°30’42.89″W in your browser address to see the exact location). Much later, in 1905, Don Fraser came to Baker Brook to build his very large wood lat saw mill near that same location on the Baker Brook. But the wood lats were exclusively for export and did not service the construction needs of the location population except to create jobs for more than 100 people which was very good. Histoire de notre famille Theriault. Baker Brook, NB. Summer 1926. Nine of the 13 children of Joachim. (L-r) Rear: Annette, Leanne, Denis, Thaddee, Theodule. Front: Georgette, Rita, Felix, George. Not shown in the photo are Therese, who had just been born, and Marie-Ange, Joe and Jeannine who were not born yet. In the background is Joachim’s mill (saw and grist or flour) CLICK ON PHOTO TO ENLARGE and download. Just a short note to let you know of some revisions to OUR HISTORY page. The page begins by telling the story of the first ‘Joseph’ in our lineage, the Joseph (1719-1765) who brought our branch of the family away from Acadia in 1759 to settle in St-Jean-Port-Joli (N47.228433° W70.213860°) in present-day province of Quebec. In 2010, Bob and Jackie joined me in the commemoration of Joseph by the Association des familles Theriaults in St-Jean-Port-Joli where we dedicated a monument to Joseph’s memory at the very location of his farmstead. So, Joseph I was Joachim’s 3rd great-grandfather. 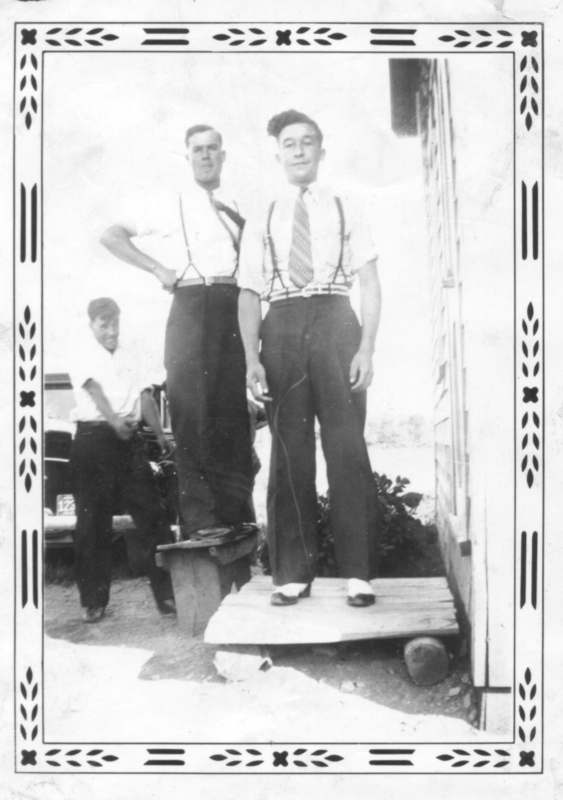 Our History page continues by telling the story of present-day MOULIN MORNEAULT and the role that the hamlet played in the lives of Joachim and his father, Joseph, and how the Theriault family came to be connected with the Plourde and Morneault families. The page wraps up the history by presenting my first draft of Joachim’s story. There will be more to his story once I finish working on my next bilingual book “Mills of Madawaska / Moulins du Madawaska”. But I want to make sure that you don’t miss the second half of the OUR HISTORY page which presents the favorite songs of the family of Joachim Theriault. I chose five songs from many others that were sung in April 1959 when the children of Joachim came together to honor their sister, Therese. It brings tears to my eyes to hear Oncle Remi’s voice along with Tante Georgette and Soeur Marie Ange’s voices and the others. A treat is to hear my cousin, Theo leading the family in singing ‘ALOUETTE’, that famous French folk song. It’s unfortunate that the recordings are not the best, but I am so grateful for mon Oncle Remi who made the recording. Turn up the volume when you listen to the songs and follow along with the lyrics which I include on each page of the songs. Hope you enjoy it. Feel free to download the the history documents which are all separate so that you can download each. Same thing with the songs; they are all MP3 files. If you have any difficult, let me know, I will be happy to email the files to you. To open OUR HISTORY page, scroll to the top of the blog and at the top of your window in the navigation bar you will see ‘OUR HISTORY’. Click on ‘OUR HISTORY’ to open that page. Have fun! Juste quelques mots pour vous dire de certaines révisions sur la page OUR HISTORY. La page commence en racontant l’histoire du premier «Joseph» dans notre lignée, Joseph (1719 à 1765) qui a apporté notre branche de la famille loin de l’Acadie en 1759 pour se installer à St-Jean-Port-Joli dans l’actuelle province de Québec. En 2010, Bob et Jackie sont joints avec moi pour la commémoration de Joseph par l’Association des familles Thériault de St-Jean-Port-Joli où nous avons consacré un monument à la mémoire de Joseph à l’endroit même de sa ferme. Ainsi, Joseph Ier était le 3ème grand-père de Joachim. Notre page d’histoire se poursuit en racontant l’histoire de l’actuelle MOULIN Morneault et le rôle que le hameau a joué dans la vie de Joachim et son père, Joseph, et comment la famille Thériault est venu pour être connecté avec les familles Plourde et Morneault. La page se termine l’histoire en présentant mon premier projet de l’histoire de Joachim. 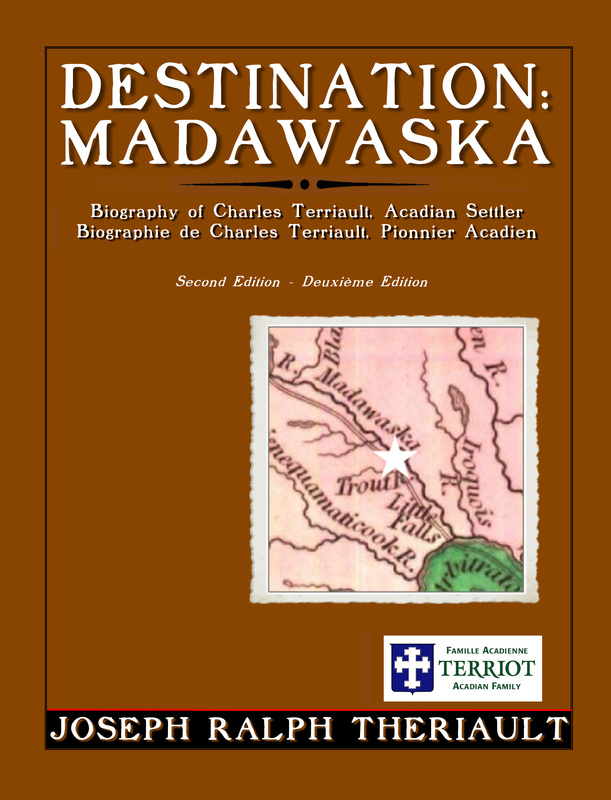 Il y aura plus à son histoire une fois que je finisse de travailler sur mon prochain livre bilingue »Mills de Madawaska / Moulins du Madawaska». Mais je veux faire sure que vous ne manquez pas la deuxième partie de la page HISTOIRE NOTRE qui présente les chansons préférées de la famille de Joachim Thériault. Je choisis cinq chansons de beaucoup d’autres qui ont été chantées en Avril 1959, lorsque les enfants de Joachim se sont réunis pour honorer leur soeur, Thérèse. Il me met les larmes aux yeux pour entendre la voix de Oncle Remi avec Tante Georgette et les voix de Soeur Marie Ange et les autres. Un plaisir d’entendre mon cousin, Theo conduisant la famille à chanter ‘ALOUETTE‘, la fameuse chanson folklorique française. Il est regrettable que les enregistrements ne sont pas le meilleur, mais je suis tellement reconnaissante pour mon Oncle Remi qui a fait l’enregistrement. Augmentez le volume lorsque vous écoutez les chansons et de suivre avec les paroles que j’inclure sur chaque page des chansons. Je espère que vous l’apprécierez. Hésitez pas à télécharger les documents d’histoire qui sont tous séparés de sorte que vous pouvez télécharger chaque gratuit. Même chose avec les chansons; ils sont tous les fichiers MP3. Si vous avez des difficultés, faites le moi savoir, je serai heureux d’envoyer les fichiers pour vous. Pour ouvrir la page OUR HISTORY, faites défiler vers le haut du blog et en haut de votre fenêtre dans la barre de navigation, vous verrez «OUR HISTORY. Cliquez sur “OUR HISTORY» pour ouvrir cette page. Bonne lecture! On August 16, 2014 in the Holy Heart of Mary Church in Baker Brook, NB., we spoke of two generations of Thériaults who we collectively still faintly remember. I am proud to be one of not many left today who can speak of their distinct memories of Joachim, of his personality and character. For Joachim’s father, Joseph, his aunt, Pélagie and uncle, Adolphe, no one is left who remembers them first-hand. As we noted on that beautiful day in August, they all made a difference in their lives… in some ways that will never be known to the family. 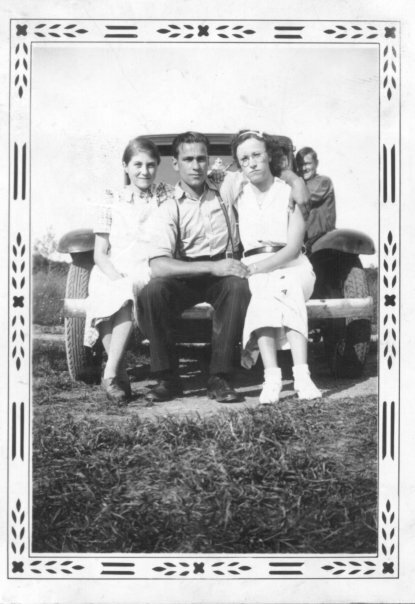 Joachim & Annie Thériault family in 1937 on the front steps of the family mill homestead. Of the family, only two remain with us today, Marie-Ange (Soeur Marie-Ange, RHSJ; front center) and Jeannine, front right. 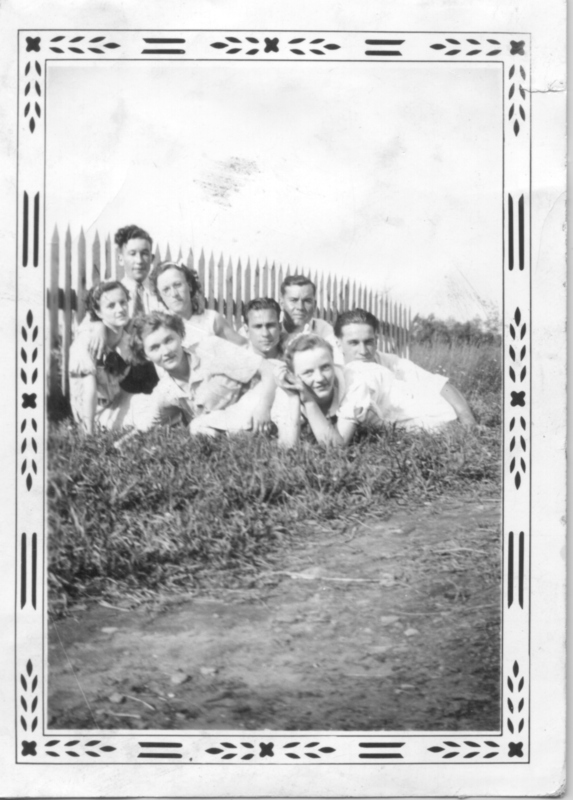 Here is the family (left-right, rear-front): Denis (oldest son), Joachim, Annie, Léanne (oldest daughter), 3rd row: Félix, Annette, Theodule, Thaddée; 2nd row: Georgette, George, Rita; front: Thérèse, Marie-Ange, Jos Adrien, Jeannine. This is the cycle of life that occurs in every family at a particular time in that generation when the older generation fades from memory sometimes without so much as a pause to look back and give tribute. But we will remember Joachim as a generous man of character, a considerate father and brother, and trustworthy friend of many. His mill was not large but he provided the construction lumber and the flour that sheltered and fed the surrounding families. Its lumber may be found in many buildings in the area and at least one church. Joachim is well documented and is well known throughout the St John valley as a good friend to have and respected as a good son, a good husband and father. Let these be the final words of testimony on his behalf. 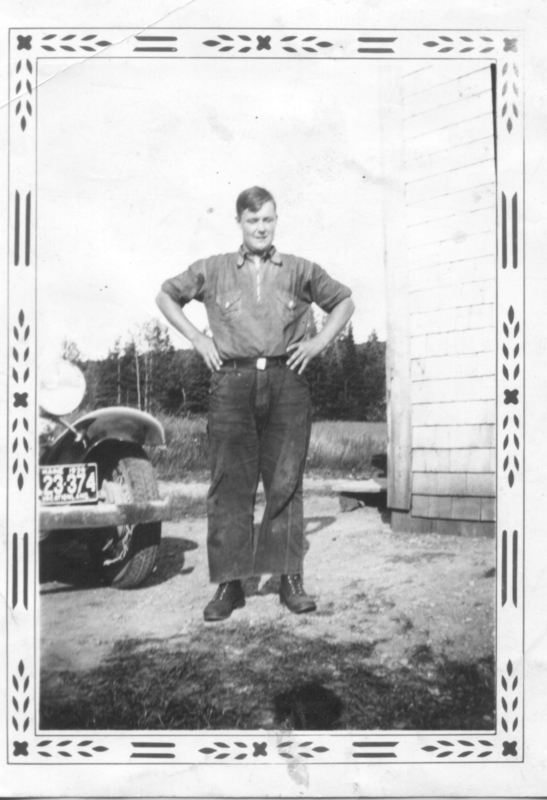 Joachim Thériault at age 37 in 1923, ten years after receiving possession of his father, Joseph’s mill in Baker Brook, NB. Le 16 Août 2014, en l’église de Saint-Cœur de Marie à Baker Brook, NB., nous avons parlé de deux générations de Thériault de qui nous se souvenons encore, mais bien faiblement. Je suis fier d’être un qui est encore ici aujourd’hui qui peut parler de leurs souvenirs distincts de Joachim, de sa personnalité et son caractère. Pour son père, Joseph et sa tante, Pélagie et son oncle, Adolphe, personne n’est laissé qui se souvient de première main. Comme nous l’avons noté sur cette belle journée en Août, ils ont fait une différence durant leur vies … en des manières qui ne seront jamais connus. C’est le cycle de la vie qui se produit dans toutes les familles à un moment donné dans cette génération quand l’ancienne génération s’efface de la mémoire, parfois sans même s’arrêter pour regarder en arrière et pour payer le tribut. Mais nous se souviendrons de Joachim comme un homme généreux de caractère; un père et frère attentionné, et ami digne de confiance d’un grand nombre. Son moulin n’était pas grand mais il a fourni le bois de construction et la farine que à hébergé et nourri les familles environnantes. Son bois se trouve dans bien des bâtisses et au moins d’une église. Joachim était bien connu dans la vallée Saint Jean comme un bon ami pour avoir et un respecté comme un bon fils, un bon mari et père. Que ce soient les derniers mots de témoignage en sa faveur. For the benefit of those cousins who were not able to join us on that beautiful day in Baker Brook. Here is our SOUVENIR BROCHURE which presents a summary of the conference. CLICK ON ARTICLE TO DOWNLOAD. A FAMILY IN TRANSITION... THREE GENERATIONS. 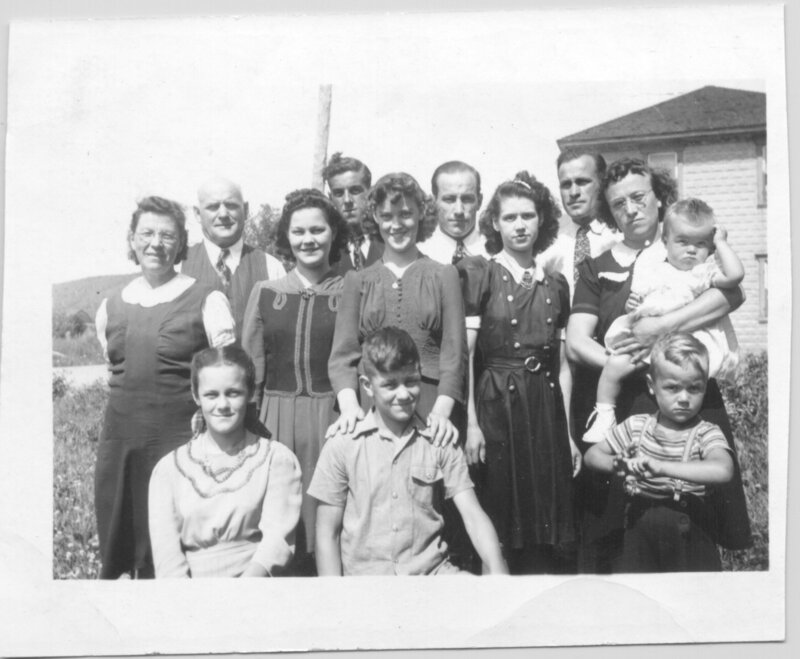 (CLICK TO ENLARGE) Front row: Jeannine and Joe Theriault, Ralph Theriault Second row: Annie, Therese, Mariange Theriault, Yvette (à George) and Elsie Theriault holding Mert Theriault. 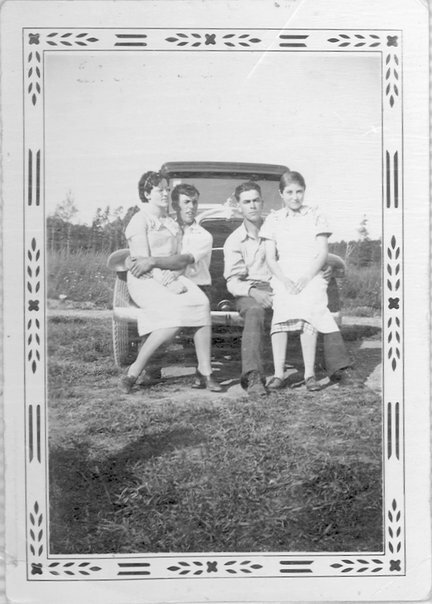 Third row: Joachim Theriault, Armand Saucier (Yvette's brother), George Theriault, Theodule Theriault, taken at the 'Maison des Pauvre' home in Baker Brook, NB where Joachim and Annie were operating the home. Summer 1943. Mert is one year old, Ralph is three. This photo was taken around the time that George and Yvette married in 1943. Gerard and Therese married in 1946. CLICK TO ENLARGE.